Cook spaghetti noodles as per package direction. Do not throw away the water in which the noodles were cooked. 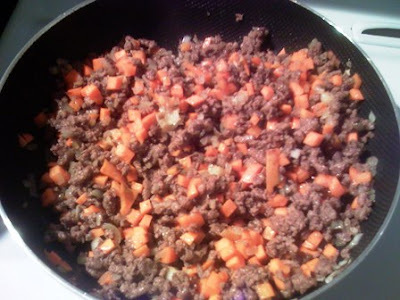 Place the ground pork in a pan and add water, just barely submerging the meat. Cook over high flame. Remove from heat when water has evaporated. Heat up the oil in a pan. Saute the garlic, then add the onion. Add the ground pork and mix occasionally til pork is brown or cooked. 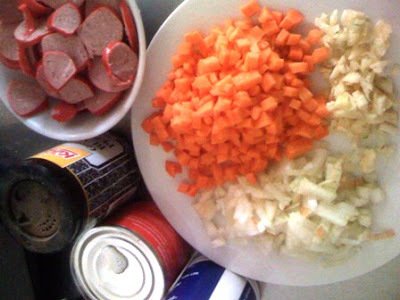 Add carrots, and after a couple of minutes add the hotdogs. Mix occasionally. Add tomato paste and some of the pasta water. Do not submerge the mixture into water though. Just enough to constitute the sauce. The paste will make the sauce thick. 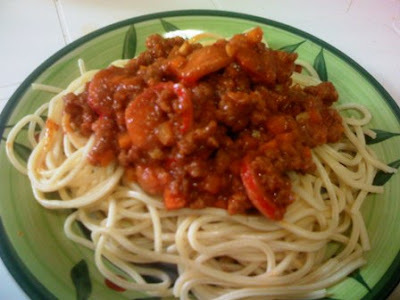 The tomato paste is sour, so to even it up, add a bit of tomato sauce. Add ground black pepper, salt, and a dash of sugar to taste. 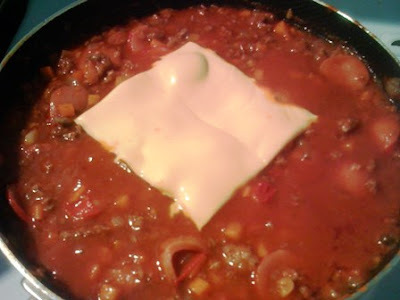 I like adding a slice of cheddar cheese to the sauce and giving it one final mix before removing from fire. This recipe has made me hungry again. I'm off to grab a plate!